Honda’s Asimo robot was taught how to walk like a human, and now its technology is returning the favor. The Japanese mega-corp has two walking exoskeletons based on Asimo research that assist humans in walking. The Bodyweight Support Assist exoskeleton is a set of thin legs attached to a seat. Users sit on the seat and slip their feet into shoes on the robotic legs. This system supports bodyweight to assist people in walking and moving up and down steps. The other, Stride Management Assist, is a brace worn around the hips and thighs that provides added strength when flexing that joint. It has been shown to increase efficiency in walking and other daily activities. It’s currently under development and being tested by 130 patients in the field. Both devices may prove to be valuable tools in helping the elderly maintain their mobility, assisting the disabled, and easing the stress on physical laborers. Check out the Honda exoskeletons in the video clips below. Walking like a robot looks pretty natural. 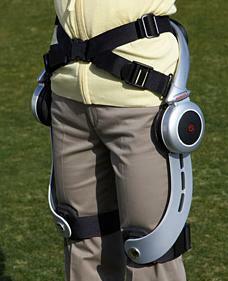 It’s unclear how quickly Honda will be able to bring these exoskeletons to market. Their latest video is actually more of a cartoonish video with some live action footage thrown in. For actual live action footage of the two Honda exoskeletons, you have to go back a little further to when Honda sent the devices out for press conferences. Check out these older videos from DigInfo and TechCrunch. I should apologize to Tsukuba University for dismissing their very similar knee exoskeleton device in my review earlier in the year. In the context of assisting the elderly, these partial leg exoskeletons make a lot more sense than I previously thought. Maintaining mobility is one of the key ingredients in keeping seniors in their homes as they age, and that is something that everyone (families, doctors, insurance agencies, etc) is looking to protect as the world population continues to age. It seems a little ironic that it will be the oldest among us (and perhaps the most techno-phobic) who are most likely to be integrated with robots first. With walking exoskeletons like those developed by Honda, the elderly will be able to get around in their homes and walk further outside them without tiring. While there are some meaningful applications in industry (as seen in the videos above) I think medical applications will ultimately dominate this niche in the exoskeleton ecosystem. It will be interesting to see how our feelings towards robots change as we see them less as the Terminators form science fiction and more as the assistants to our grandparents. Should be harder to fear the machine when you’re giving your cyborg granny a hug.